One of Hawaii's most charming small towns, Hanalei is built around the crescent-shaped Hanalei Bay with a backdrop of verdant mountains on the lush and tropical north shore. This region has a timeless beauty with shimmering waterfalls cascading from the high peaks, and a large, relatively well-protected bay lined with golden sand beaches bordering aquamarine waters that create an ocean playground. Hanalei Bay is one of Hawaii's best locations for ocean activities including swimming, snorkeling, kayaking, stand up paddle boarding, sailing, fishing and long beach walks. Take a sunset sail or go on a whale watching adventure, or just relax on the beach taking in views of the distant Makana Mountain (Bali Hai) and the three prominent peaks of Hihimanu, Namolokama and Mamalahoa towering over Hanalei town. As you arrive on the north shore your first glimpse of Hanalei will come at the Hanalei Valley Lookout which provides a picture postcard view of the meandering river amidst the green patchwork of taro fields at the foot of the mountains. Driving down the hill takes you over the historic Hanalei Bridge which was built in 1912 and is the first of seven one-lane bridges on the north shore of Kauai. Just past the bridge are expansive fields of taro where you may catch a glimpse of endangered Hawaiian waterbirds including the black-necked stilt, moorhen and coot as well as the native Hawaiian duck known as koloa. Also keep an eye out for the nene, or Hawaiian goose, which is Hawaii's official state bird. 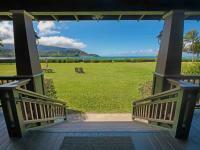 History buffs will enjoy a visit to Hanalei's Waioli Mission House which was built in 1836 and is now fully restored including historic furnishings from by-gone days. Located in front of the Mission House is the 1912 Waioli Hui'ia Church, a picturesque structure with beautiful stained-glass windows making it one of Kauai's most photographed buildings. To learn about Hanalei's rice growing era visit the Hoopulapula Haraguchi Rice Mill, Hawaii's only remaining rice mill, which was built in 1930 and is now fully restored. It's located in the Hanalei National Wildlife Refuge on a working taro farm and is a great way to learn about Hawaii's agricultural and cultural history. You'll even get a taste of the Polynesian plant in your lunch served while visiting the rice mill (reservations required). At the Hanalei community center you can listen to Hawaiian slack key guitar and ukulele concerts featuring traditional songs and stories of Hawaii's musical past. Other local live music is featured nightly at several Hanalei restaurants as well as just up the hill at the St. Regis Princeville Resort. Hanalei Bay is a favorite of ocean enthusiasts and beach lovers. The waters of the bay are relatively well-protected from the open ocean, and the wide, sandy beach along the bay makes it ideal for sunbathing and peaceful beach walks. For long days of enjoying the beach, Hanalei is excellent due to the golden sand, clear blue water, lifeguards and facilities including restrooms, showers and pavilions for picnicking. Volleyball is also popular and it's fairly easy to join in on one of the pick-up games that occur on most days. From Hanalei it's just a short drive to other great north shore beaches. The expansive and scenic Lumahai Beach is just west of Hanalei Bay, and a bit farther down the road is Makua, popularly known as Tunnels Beach for the many underwater caverns that make it one of Kauai's best snorkeling beaches. On the north shore of Kauai eating is truly a delightful event and not just a necessity. You'll find everything from the recognized tastes of American cuisine to the savory flavors of the heart of the Mediterranean. Plate lunches are also popular, as is shave ice and tropical flavored ice creams. Stop in at the Hanalei Fish Market and Dolphin Restaurant for freshly caught seafood. If you're hungry for Polynesian food check out the local landmark Tahiti Nui which is also a great place to see local musicians and spontaneous hula dancing. This is also where George Clooney filmed scenes for The Descendants. For a great breakfast check out Hanalei Wake-up Cafe. 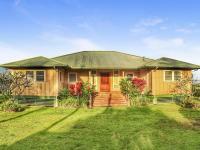 A hearty burger and beer is found at the Hanalei Gourmet in the Old Hanalei Schoolhouse building constructed in 1926. This is also a great place to see live music in the evenings. For a pleasant atmosphere and beautiful decor try Bar Acuda in Hanalei with an open kitchen and outdoor seating to enjoy the tapas and fine wine. If you're looking for something with a local flavor featuring locally grown products visit Makana Terrace at the St. Regis Princeville overlooking Hanalei Bay. Head the other direction from Hanalei for oceanfront dining at the Hanalei Colony Resort's Mediterranean Gourmet. Whether you are looking for a relaxed lunch or an exquisite dinner this north shore restaurant merits a visit. 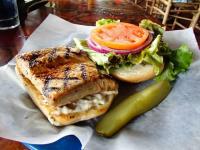 There are numerous restaurants in the Hanalei area to satisfy your appetite. Enjoy the adventure of tasting your way around town while checking out the shops and boutiques. If you need to stock up on supplies you will find grocery stores in both Hanalei town and nearby Princeville Resort. Hanalei town has an eclectic mix of art galleries and boutique shops offering everything from furnishings to local crafts and ukuleles. It's a fun place to browse around, and meeting the shopkeepers and artists enhances the experience. You can also meet local farmers at the weekly Farmers Markets. In the center of Hanalei town is Ching Young Village, a third generation family-owned shopping center that has grown from its beginning as a store during the rice era. Today, it is a central location for shops, restaurants, and services. Across the street from Ching Young are many more shops housed in the Old Hanalei Schoolhouse building including the Hanalei Surf Company which also rents ocean sports equipment. Renting a car is recommended when visiting Hanalei so you can fully explore the town and neighboring communities as well as local attractions from the Na Pali Coast to Princeville and Kilauea town. The waters of Hanalei Bay are typically very calm during the summer months making it a great place for many ocean activities. However the winter months frequently bring large surf to the north shore, creating waves and currents that can pose hazards to beach goers. Always check with the lifeguards about ocean conditions and areas to avoid on any particular day. Even during the winter there are many days when the waters of Hanalei are quite calm and pleasant. During times of large waves the safest area of Hanalei Bay is near the Hanalei Pier, though on very big surf days even this area may be unsuitable for swimming due to waves and strong currents. The beach along Hanalei Bay is wide and sandy, sloping gently into deeper water. The sandy bottom makes it great for swimming when the water is calm, and also excellent for bodyboarding or for learning to surf when there are small waves. Coral reefs fringe both ends of Hanalei Bay, and on the outer edges of these reefs are more advanced surfing spots where the locals display their expertise. Each corner of Kauai reveals its own unique charms and character, and the north shore certainly doesn't disappoint. Stunning vistas, great beaches and hikes, and a quaint small town provide everything a visitor might want. Our Hanalei vacation rentals are in the best locations near Hanalei Bay and in the Princeville Resort area with many shops and eateries easily accessible. Browse through our listings to get an understanding of the different amenities and property features we offer. We take pride in having the largest selection of high-quality Hanalei rentals and we stand behind our product, listing only the best properties on our site. If you have any questions please give us a call and we will be happy to assist you. More than just a pretty place, Hanalei also has a rich history. The first evidence of this comes as you enter the region by crossing over the historic Hanalei Bridge which was built in 1912 and is now considered the "gateway to Hanalei." From the taro fields to Hanalei Bridge and Hanalei Pier there is history all around you on the north shore. Movie buffs will recall that the pier was featured in the 1958 film classic South Pacific. Hanalei Pier was originally built in 1892 for inter-island steamers to unload supplies and take away beef cattle. Hanalei has been an agricultural community since the first Hawaiian settlers planted taro as their main crop. Today Hanalei remains the top taro farming region in the state. Taro is used to make poi, a staple in the Hawaiian diet which can be tasted at almost any luau.